The backyard of your home should be your sanctuary. When you go there, you should feel relaxed, and you should be able to kick back and truly enjoy it. The best way to do this is to have a swimming pool installation done so that you can feel like you’re on vacation while you’re in your backyard. A pool contractor in Salt Lake City can make this possible. Here are some other ways that you can make the most of your space. Eating in your backyard is great, but it can be annoying to have to run in and out of your house every time you need something from the kitchen. To solve this problem, why not dedicate some space to putting in a small outdoor kitchen area? You can prepare food in it, store kitchen items, and clean up once you’re done eating. There’s no reason to have just grass surrounding your pool area. Instead, find the right mix of bushes, plants, and flowers to turn your backyard into paradise. You can also add hardscaping to your backyard and surround your plant life with stones. You shouldn’t put in anything that’s too difficult to maintain, but with the right additions, your backyard will look totally transformed. Unless you live somewhere where it stays very warm well into the night, an outdoor fire pit can be a great way to keep the party going in your backyard once the sun goes down. Before you settle on the location of your swimming pool installation, figure out the best place to put a fire pit so that it’s centrally located but not too close to the pool. Once you have everything else installed, figure out places to put seating for people. The last thing you want to do is run out of it, so use a variety of different seating options. 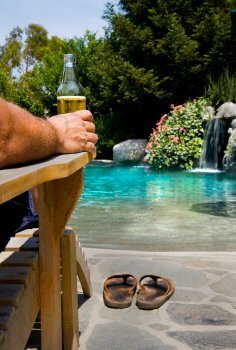 From lawn chairs to stone walls that double as seats, there should be plenty of places for people to sit by your pool. Chlorine is a crucial part of swimming pool maintenance, as it keeps your pool sanitary and safe for use. Chlorine kills harmful bacteria in your pool water, and prevents the growth of algae. If you are interested in hiring a pool maintenance company in Salt Lake City , they will test and adjust the chemical levels in your pool on a regular basis to ensure that the levels are healthy. Watch this video to learn more about chlorine and how it is used in swimming pool maintenance. J. Garcia, a pool chemical specialist, discusses what chlorine is, and why it is necessary to keep your pool sanitary. Now that summer is here, it’s time to take advantage of the warm weather by using your pool as often as possible. Prior to swimming, it’s important to make sure that your pool is up to standard to ensure the health and safety of you and your guests. Continue reading to learn some key tips for swimming pool maintenance in Salt Lake City. Remove your pool cover, spa cover, or hot tub cover. Clean the cover and store it in an area where it won’t be subject to damage from bugs or animals. Clean and vacuum your swimming pool thoroughly, and clean and inspect the pool’s deck, tile, and grout. Test the water balance, pH level, calcium hardness and total alkalinity levels. If you are unsure of how to test these levels yourself, bring a sample of your pool water to your local swimming pool services company for testing. Add algaecide to your pool if necessary. Check your swimming pool components to make sure that they are all undamaged and operating correctly, and lubricate the swimming pools fittings, valves, o-rings, and plugs. Remove leaves and debris from the swimming pool. Test and adjust the levels of chlorine and sanitizer in the pool as necessary. Chlorine levels should be between 1-3 ppm, and bromine levels should be between 3-5 ppm. 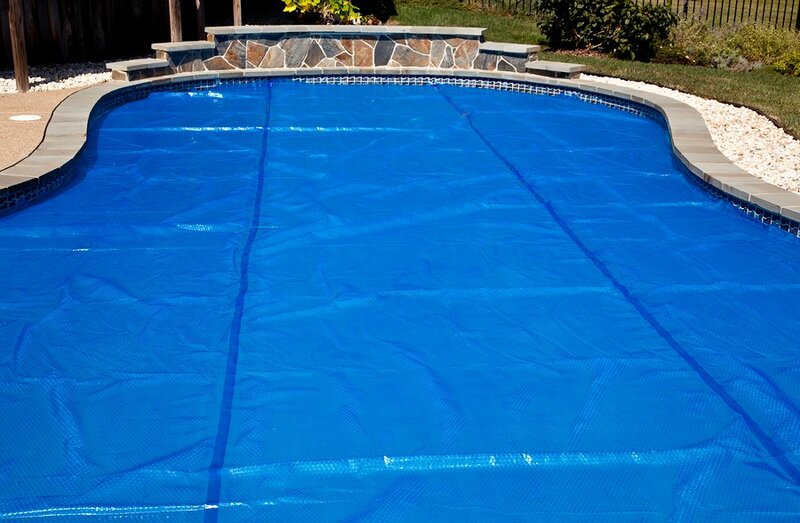 Ensure that the swimming pool’s water level is high enough. Text the pH balance of the pool; the level should be between 7.4 and 7.7 if the pool has a vinyl or tile finish. If the pool has a fiberglass finish, the range should be between 7.3-7.5. Do not correct the pH level of your pool more than once per week. Test and adjust the pool’s alkalinity, oxidizer, and stabilizer levels and adjust as necessary. Test and adjust the pool’s calcium hardness and total dissolved solids levels. Test and adjust the total alkalinity level, which should be between 120-150 ppm. Chemically clean the pool’s filter, and clean and inspect the pool’s tile, grout, and sealant. If your backyard has a swimming pool, there are a few additional features you can add to make the area even more enjoyable. 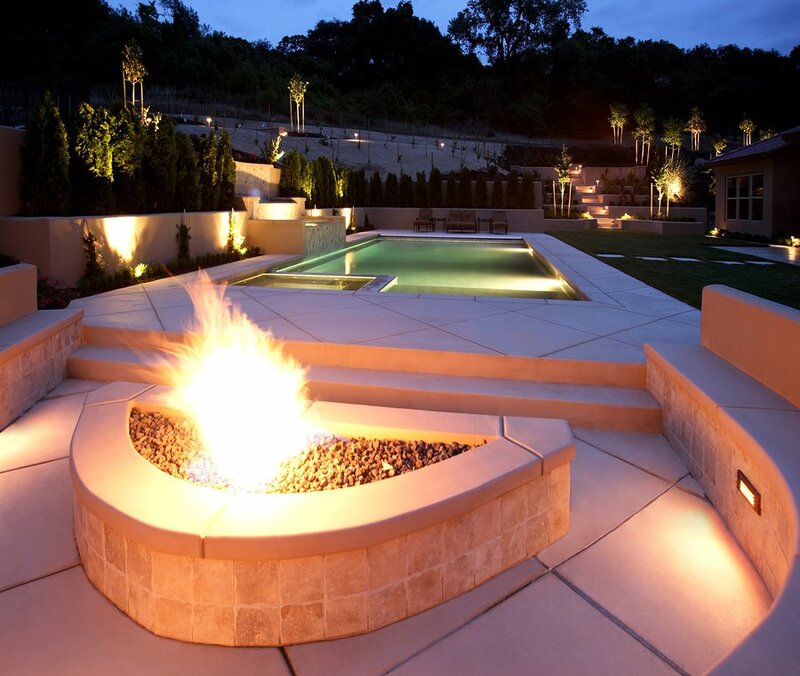 Outdoor fire features are the most popular addition to most families’ pool areas. If you’re looking for an outdoor fireplace or outdoor fire pit in Salt Lake City , read on to learn more about them. Outdoor fireplaces are a lovely focal point of any backyard. They are placed on the outside edge of a patio, providing ample room for landscaping and outdoor furniture. They can be used for fun barbeques in the summer, and a cozy source of heat in the winter. If you provide seating and a table near the outdoor fireplace, it will become a central gathering spot for family and guests. Outdoor fire pits are typically located in the center of an outdoor patio. They can be custom designed and built to the owner’s specifications, and can use wood, natural gas, or propane as ignition. Seating can be provided around the exterior of a fire pit, and the pit can be covered in the warmer months if it will be unused. Some covers even allow the fire pit to double as a table.